The needles may be falling off, and there may be a stray strand of tinsel here and there, but that Christmas tree isn't done working for you yet. 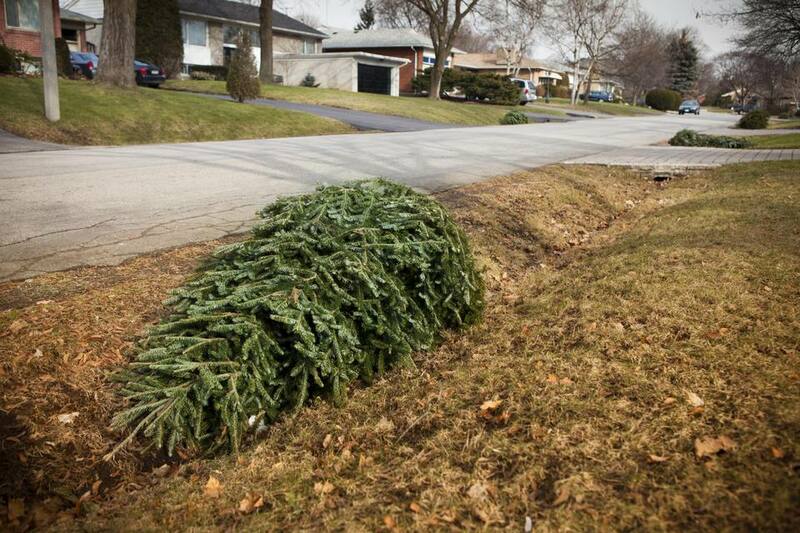 Before you toss it on the curb, here are a few ideas for ways to recycle your Christmas tree in your garden. You can leave the tree right in its stand, and set it out in the yard for the rest of the winter. It can fill in a bare spot, giving you something pretty to look at, but, more importantly, it can provide winter shelter for birds. If you have plenty of trees around consider laying your tree on its side to provide shelter for mammals such as rabbits. Cut long branches from your Christmas tree with loppers or pruners, and lay them over perennials. This is especially useful for perennials that are susceptible to frost heaving, as well as those that are only marginally hardy in your zone. A covering of evergreen branches could be the difference between losing a plant this winter and seeing it bloom again next year. The best base for a new compost pile is a layer of thin branches -- including evergreen branches. This allows a bit of airflow at the bottom of the pile, and the branches will break down over time. Just trim them down so they fit in your bin, then stack them four to six inches high. After you've got them in, go ahead and start adding your kitchen scraps and other compostables as usual. And, no, you don't need a fancy chipper/shredder to do this if you don't have one. I've gotten into the habit of cutting the thinner Christmas tree branches into little pieces and adding them to the mulched paths between my vegetable garden beds. Simply snip them into one to two inch pieces and toss them on the path. It's a cheap way to mulch a path way, and, as a bonus, this path smells absolutely wonderful when you walk on it! If you live in a Northern zone, you'll be starting peas in a little over three months! Save the branches from your Christmas tree to stick into the ground wherever you plant your peas. The pea vines will climb the branches -- evergreens in particular work well because there are so many little branches for the tendrils to grab on to. Insert the branches into the ground in a criss-cross fashion, so that one branch helps support the one next to it. You can also tie the branches together where they intersect to help stabilize your pea brush. Plant supports for FREE -- works for me. As far as reusing the trunk of your Christmas tree, you can lay it on the ground to use as a rustic garden bed edging (once you've trimmed all of the branches off of it, of course) or use it as a support to grow vining plants, such as morning glories, on. Even if you can't figure out a way to use the trunk in your garden, it's better to put the trunk out for recycling, rather than just tossing the whole tree away. Let's put those Christmas trees to work in our gardens!